Maximum 4 birds per box. 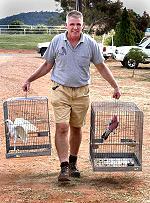 Birds can be entered between 5.00pm - 7.00pm Friday and 7.00am - 9.00am Saturday. NO LATE ENTRIES. All exhibitors are to register at the front door, with the following information:- Name, Address Phone No, Number of birds & payment. There are no birds to be brought in through the front door. Once registered the exhibitor is required to bring birds to the first door on either side of the hall where cages & bird numbers will be inspected before benching. 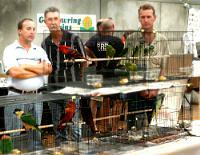 Exhibitors to bench birds as quickly as possible and then must leave the selling area. Helpers are not permitted into the selling area. Assistance will be provided by N.V.A.C members. Open to public at 10.00am - sale to commence 10.00am - 2.00pm. No more than FOUR birds per cage. All cages/boxes must have a solid bottom and a perch. All birds to have feed and water at all times - owner's responsibility. N.V.A.C. has the right to refuse entry of birds, cages & trade stands. N.V.A.C. bears no responsibility for birds entered in the sale. Cost for sale - $1.00 per bird - sell your own PAYABLE UPON ENTRY - STRICTLY CASH ONLY. Out of state exhibitors most welcome but must organise their states own paperwork. NO PRE SELLING OF BENCHED BIRDS. SELLERS CAUGHT DOING SO WILL BE EVICTED FROM SALE. Exhibitors must book by phone or email before 4th April 2018.